I want to thank you for all your prayers and kind messages. and your own stories of loss. was even more limited that I ever anticipated. I have ever had to endure thus far in my life. 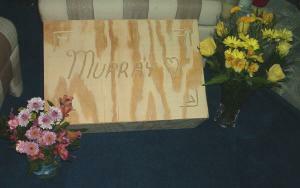 I had to put my precious Murray to sleep. He was laid to rest on Sunday March 13, 2005. Without my family, I would not have been able to withstand those two heartsick days. I appreciate beyond words their selfless efforts and unconditional support. and I could not catch mine. and for your love and care throughout his illness, and for getting his paw print for me. Jeanne, my sister, I thank you for your honest love, concern and wisdom. and your tears of love and concern. and your love, concern and getting his paw print for me. but you all did it without once complaining, and for that I am grateful. about the loss of a cherished pet. to shape or mold my words to my own satisfaction. one so special and so loved as Murray is to me. once occupied by his magnificent quintessence. something he so often felt the need to do, repeatedly! and a mischievous prankster the next. 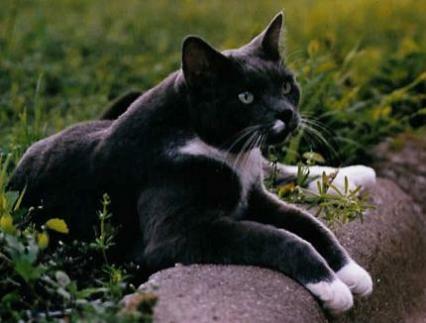 the meaning of his converse was concise yet inquisitive.
. Murray was an exceptional feline with purity of heart and spirit dignified. I feel like I have eternally lost my best friend. 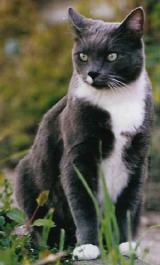 I found Murray when I moved to a garage apartment in Abilene, Texas in February 1988. He was a stray about 1 year old. From the first moment we met, there was a feeling of compatibility and ease between us. Try as I might, I don't recall ever having to train Murray to stay off counters, not scratch furniture, not eat the plants, etc... The minute he came into my life, his easy going but elegant style always amazed me. Murray's only demand of me was that he be allowed to go outside and explore nature, as he had done before he decided to adopt me. Walking him on a leash and harness seemed like a good compromise. Again, I was so impressed by my boy. With not one protest or attempt to wriggle free, he accepted the leash and harness like he had worn one all his life. We even got to the point where I did not need to restrain him. We would take our walks like two chums catching up on the days events. He listened to me when I would tell him to come back, or turn a certain direction, or to stop all together. such as scratching a tree at a bizarre angle, or bounding and leaping at the grass like a furry little gymnast. 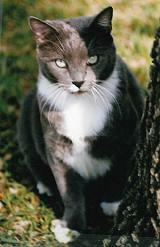 because although I did not want to admit it, I feared that was going to be the last time he ever scratched a tree. Murray enjoyed meeting people, especially toddlers. It was ironic though, because of his size many small children were a bit scared of him. He loved traveling to different places, especially other people's homes. I think it satisfied his nosey nature to snoop through an unknown house. that in those last seconds he knew how much I love him, and felt peace and no pain. Thank you for sharing this tribute for a truly unique cat with me.